This is Oso. Little Oso Fluffy Boy. Oh, he warms my heart like no other. 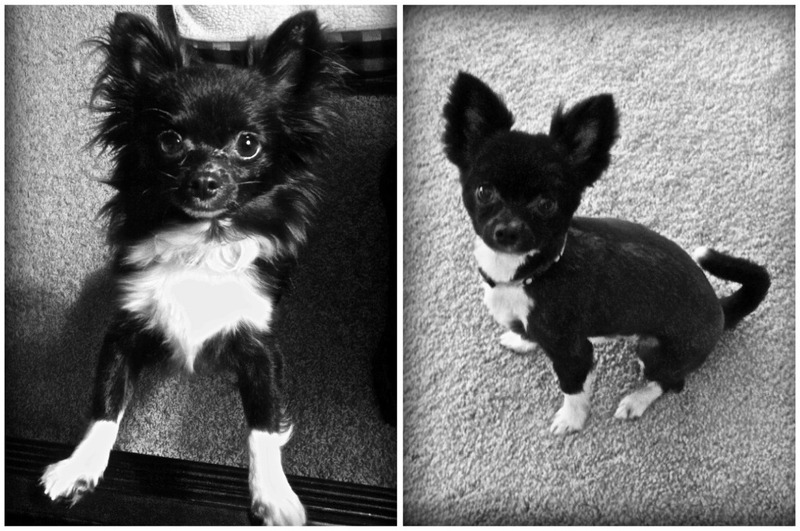 He is a black and white long-haired chihuahua. He just turned 2. He weighs all of 4 1/2 pounds. Let me tell you, he is precious and he loves to cuddle. If I could have a house full of puppies, as I mentioned in this post, this is the kind I would want. Yep. An entire house of them. Of course, none of them would bark or have accidents or anything like that. They would just be little, cute, perfect snuggly pups. Anyway, Oso goes by many names. I'm sure you know that Oso means "bear" in Spanish. Oso, in English, can be translated to "oh-so." Some of his more popular nicknames include: Oso Fluffy, Oso Tired, Oso Excited, Oso Suspicious (my favorite), Oso Adventurous... And so on. Due to the fact that Oso is oh-so cute, I was inspired to buy my own puppy to snuggle with at night, since Oso doesn't live with me (anymore). The puppy I bought is a Nap stuffed puppy, from Brookstone. Needless to say, I could only think of one name to call him. Notso. My stuffed dog's name is Notso. Notso Snuggly, Notso Rambunctious, Notso Alive. Ha. Anyway, that is Oso. He is adorable and too special not to share. I hope you had oh-so much fun reading about him.